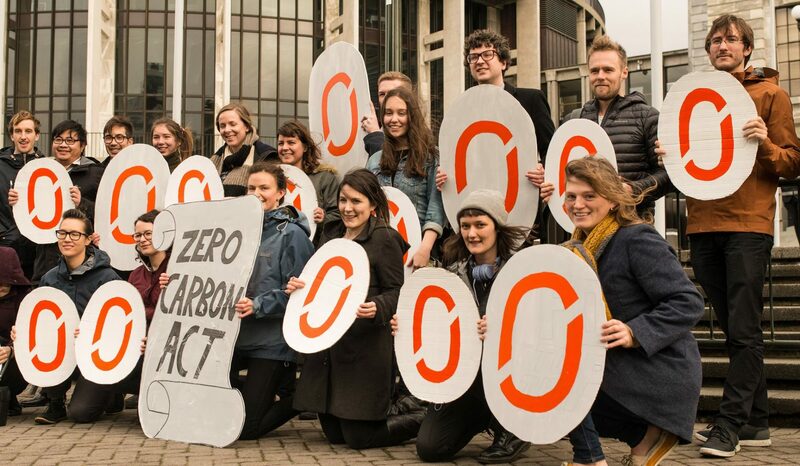 Generation Zero is a nationwide, youth-led climate advocacy group who want to see our country on track to a carbon-neutrality by 2050! Since April last year, Rosalee Jenkin and Francesca Bradley have been knee-deep in Generation Zero’s national campaign for a climate change law. Then, in December last year our new Government laid out its plan to develop and pass the Zero Carbon Act into law. On top of all this both Rosalee and Francesca are passionate cyclists. We got the inside story on life in the saddle. Hi Francesca and Rosalee. Tell us a bit about yourselves and your involvement with Generation Zero. R: I grew up in Lower Hutt and Motueka, but now consider Christchurch to be home. I got involved with GZ because I saw all the great stuff they were getting up to in Wellington and wanted to be part of it! So when some GZers came to Christchurch on a nationwide speaking tour in 2013 I was primed and ready to help set up a Christchurch branch. In GZ I found a group of people who are just as passionate about doing something about climate change as me, who are loads of fun, and just awesome humans!! F: I stumbled across GenZero initially through my partner who got involved during his uni years. Then I guess once I got to know all the on-to-it and accepting young folk involved, it’s proven pretty hard to walk away! 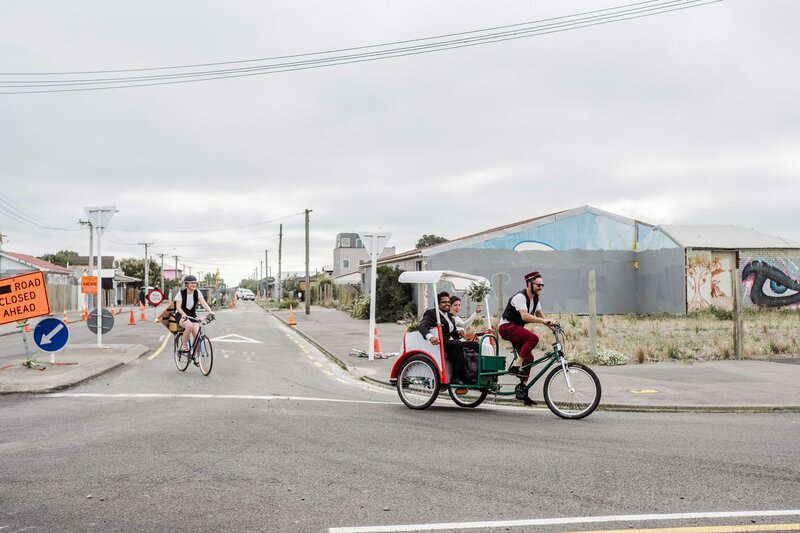 Being involved in Generation Zero has surprisingly harvested a keen interest in Christchurch’s cycling scene. I grew up in Wellington naive to the ease and benefits of cycling. So when I moved to Christchurch over 5 years ago, buying my first bike was a real lifestyle game-changer for me. We know that the both of you love riding your bicycles. Tell us a bit about your set up and your commute. F: I cruise into town on my 1970s blue Avanti step-through. 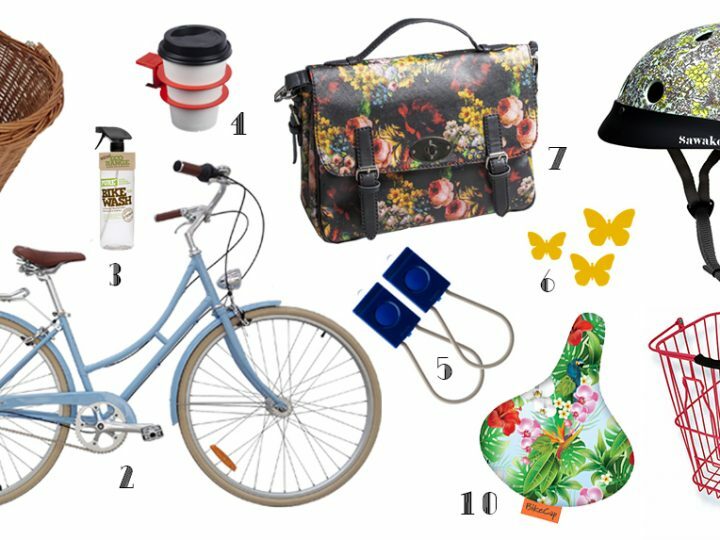 The Quarryman’s Trail cycleway is just outside my door, so I love joining the long line of cycling commuters down Antigua St. I’ve now kitted my bike out with Action Bicycle Club’s super handy Basil panniers and trendy Thousand helmet for a super styley commute. The both of you are clearly concerned about climate change, its an issue that you raise awareness for, how do you think Kiwis fare regarding the issue? F: Well it’s a huge commitment from our current government to develop a Zero Carbon bill. This is a huge success in terms of setting New Zealand on the right track to carbon neutrality by 2050. Climate Change is a tricky issues for individuals to relate to on a personal level. So, through the work that Generation Zero does, we’re trying to provide tangible solutions to climate change through smarter transport, liveable cities & independence from fossil fuels. 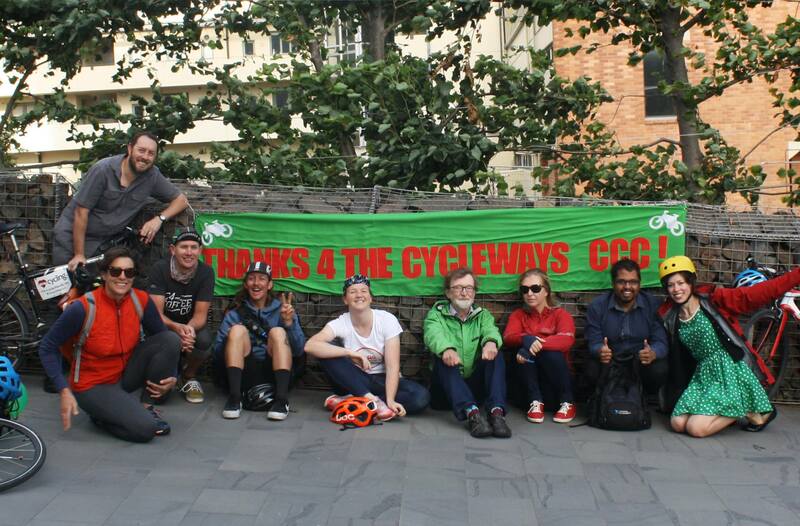 The Safer Cycleways Party was organised by Francesca as a way to say thanks to our City Council for the work they have done. We heard Rosalee tied the knot recently. Francesca, can you tell us about what went down that day. Rosalee was pretty determined to incorporate her love of cycling into her wedding day! So thanks to Energy Messengers’ providing a pedicab and my partner’s lycra-trained legs, this bike-powered wedding was in business! 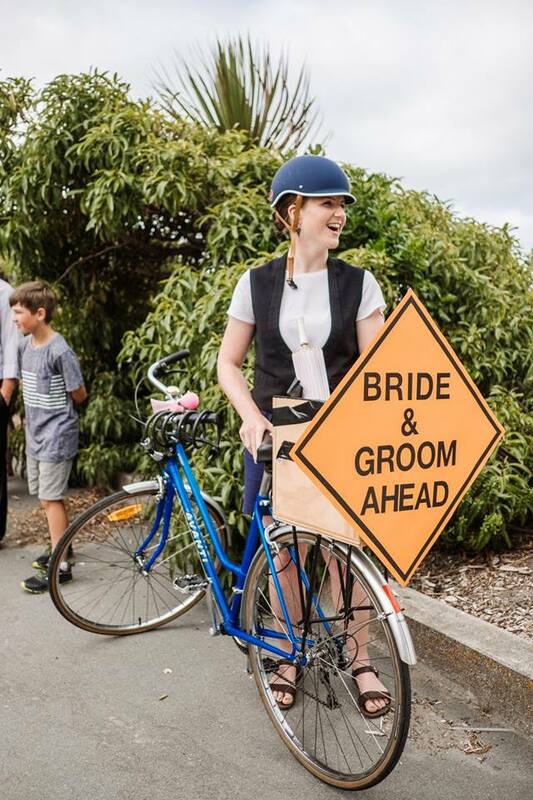 I kitted out our convoy out with hand-made road signs to manage the traffic and we pedalled our good friends from their ceremony in St Albans all the way out to North New Brighton. We got so many overwhelmingly positive reactions from motorists along the ride. At every intersection we pulled up to motorists were beeping like mad, waving and cheering out congratulations to the bride and groom. Where do you hang out in Christchurch? Can you share some enjoyable bike rides / trips. R: I love biking through Hagley Park – at any time of year, but particularly autumn and summer. I’ve recently moved to Sydenham, so I’m pretty excited about the major cycle route going down Strickland Street. 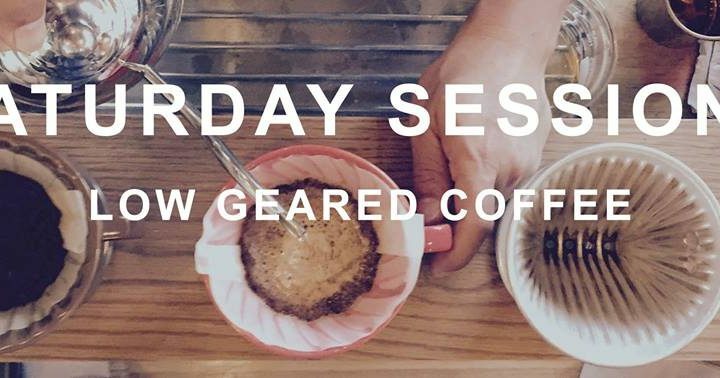 F: In the weekends you’ll find me up in the Port Hills riding along Summit Road out to Godley Head (I just do it for the coffee afterwards 😉 Otherwise, I’ll be cruising around town testing the capacity limits of my pannier… I’d also recommend riding out to the Heathcote Valley, stopping for a Utopia ice cream in Sumner or biking out to Bicycle Thief near Tai Tapu – you definitely need a reward at the end of your ride. What’s next for you guys and Generation Zero. R: Well now that the Government has committed to making the Zero Carbon Act a real thing, our next task is to get all of Parliament behind it, and get as many people as possible taking part in the public consultation. F: At a local level there’s plenty to do in Christchurch, with both our regional and local councils drafting up their Long Term Plans. 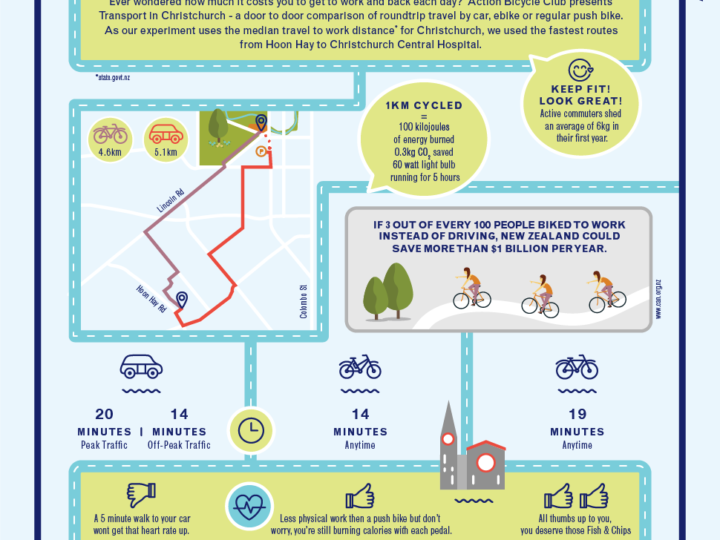 We need to rally to troops to let Christchurch City Council know they can’t delay works on the Major Cycle Routes and we also have a lot of work to do to get our public transport system moving! And finally, to the readers that would love to cycle but are working up the courage. Can you share some tips and encouragement to help them on their way. R: Doooo it! Discover the freedom! That sounds pretty cheesy, but it’s honestly a lot about freedom and flexibility for me. I turn into such a stessed-out grump if I have to drive anywhere! On a bike there’s no getting stuck in traffic, no worrying about finding a car park, and it gets you right to the door! F: Yeah definitely give it a go – there are so many different bike options out there to find exactly what suits you! I just love seeing the inventive parents out there with their kids in tow on a trailer, rear or front bike seat or a kitted-out cargo bike – it really makes my day! Hire a bike, see if you like it and see where you end up! If you’d like to learn more about Generation Zero or get involved, join their facebook group or email them at christchurch@generationzero.org.nz. Throw the Spotlight on Mum this Mother’s Day!